1. Preheat the oven to 200ºC, gas mark 6. Place the rhubarb in a baking tray and scatter over the sugar, orange juice and zest with one of the vanilla pods and place in the oven to bake for 15-20 minutes, until the rhubarb is tender but still holding its shape. 2. Soak the gelatine leaves in cold water until softened, for about 5 minutes. In a small saucepan, warm the milk with the honey and scrape in the vanilla seeds. Remove from the heat and stir in the squeezed gelatine leaves, then stir until dissolved. 3. Pour the gelatine mixture through a sieve into the yogurt, and stir to combine. Pour into 6 glasses and place in the fridge to set. 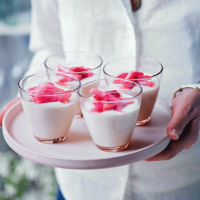 Serve the panna cottas topped with the rhubarb.